Caption: Members of Prosthetic Users group meet on location with Rick Headley, Driver Rehabilitation Specialist in Marietta. Front Row: Jay Yost, Kay and Bill Enlow. Back Row: Fred Yonda, Rick Headley, Nancy Miller, Jack and Linda Fetty, Francis Trickett, Kim and Jeff McLaughlin. Limb loss in the Mid-Ohio Valley is more common than you may realize. In fact, according to the National Amputee Coalition’s report, there are over 2.1 million people in the United States living with limb loss and 507 people who lose a limb every day. If you or your friend/relative are living with limb-loss or facing an amputation, know that you are not alone. Amputees living in the Mid-Ohio Valley and surrounding area get together monthly to share tips & tricks for adapting to life with limb loss. The meetings often start out with a speaker. Recent speakers have included a variety of physical therapists, massage therapist Kenna Lewis from Zenergy, and even member Dr. McCarter, Chiropractor and owner of McCarter Health Center. The group has occasionally met at different locations. The photo was taken with driver rehabilitation specialist Rick Headley, from Memorial Health Systems. 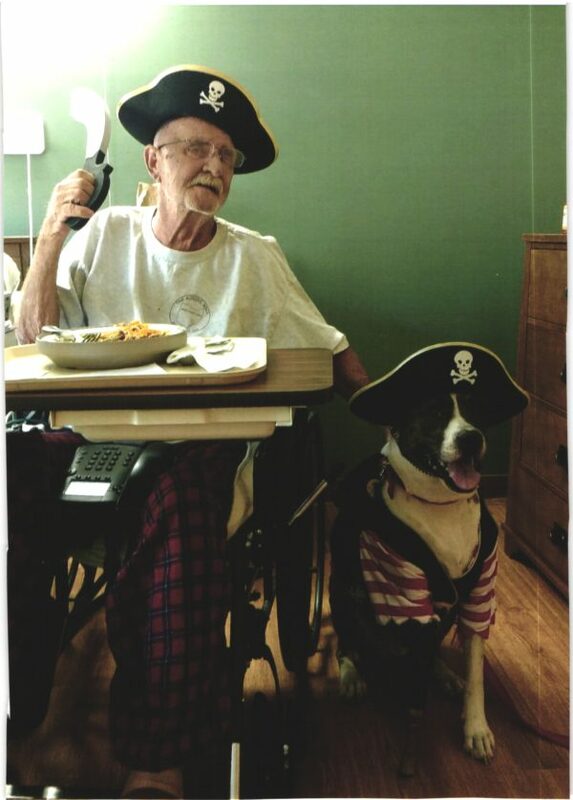 In the past, they have also met up with the amputee support group from Columbus, Amps4Ohio, for day trips to Blennerhassett Island and Lake Logan. The members also set personal goals, and when they are achieved, they are awarded with a gold medal for that month. Goals range from taking a few steps to riding a bike again or returning to work. This local group is part of the national support group network from the Amputee Coalition. A variety of printed material is available free of charge at the meetings as well as links to online resources. Novels featuring amputees, such as “Living with No Excuses” by Noah Galloway and “On My Own Two Feet: From Losing My Legs to Learning the Dance of Life” by Amy Purdy, are also available for members to “check-out”. At the meetings, the group is also exposed and encouraged to participate in a variety of activities. For example, adaptive snow and water skiing, kayaking, ballroom dancing, rock climbing, the Annual Amputee Coalition’s National Conference and the Annual Amputee Celebration in Columbus, Ohio. 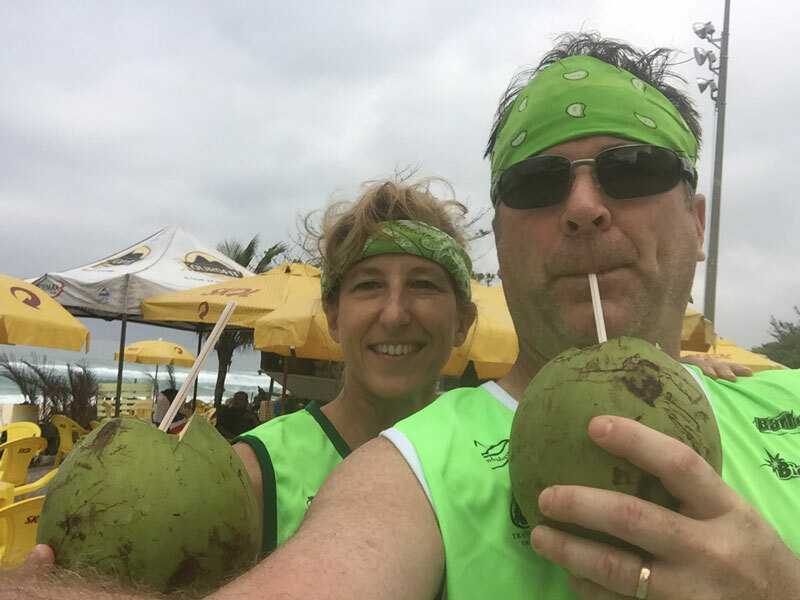 Group leaders Mark and Nancy Miller are always willing to attend the activities and conferences with members to help them knock another goal off their list. An instructor is lined up to provide an 8-hour training for the National Amputee Coalition’s Peer Visitor Training. This will certify members to visit people who are considering an amputation, or who have recently undergone an amputation. 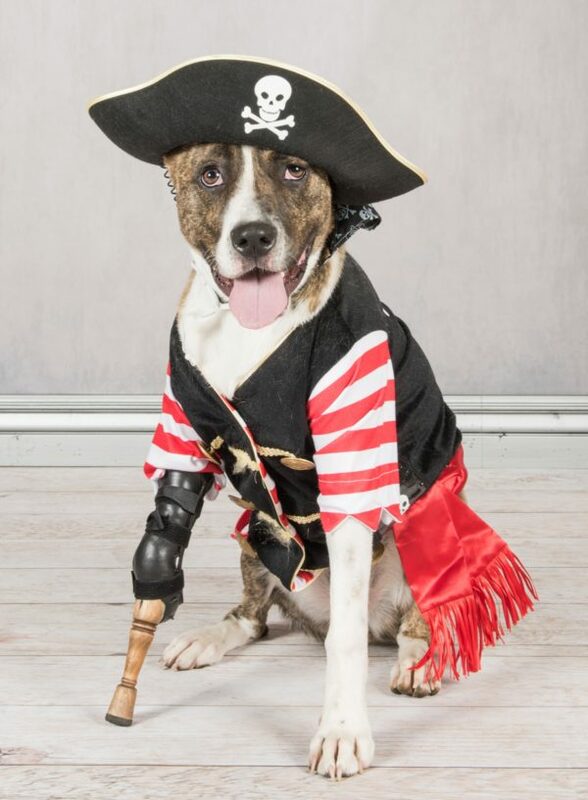 It is important for people to know that there is life after amputation, and it is often possible to return to their previous activity levels. Often, when a new amputee sees how well a peer walks with an artificial limb, their hope and motivation is restored. They can also ask questions to someone who has already experienced the range of emotions and physical issues or challenges that they are currently going through. The training date has not been set yet, but if you are interested, call Nancy Miller at 740-421-4211. The group is sponsored by Miller Prosthetics & Orthotics and is open to everyone with limb loss and their family and friends. 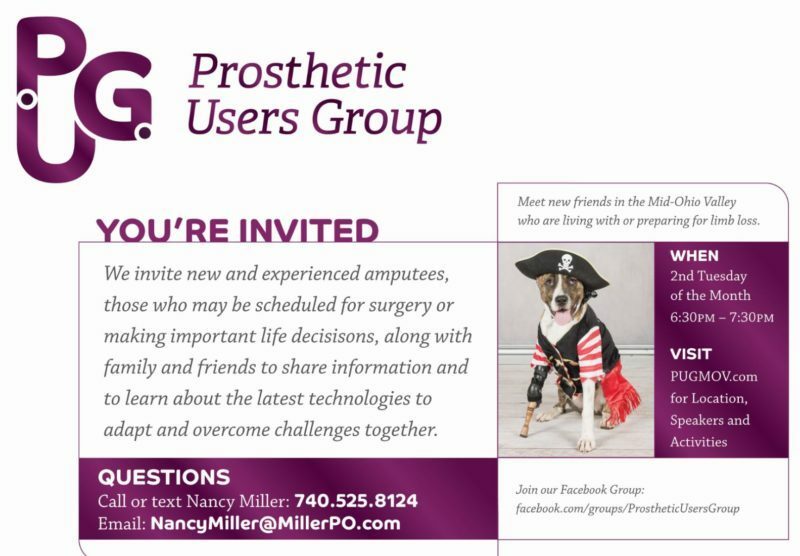 The group usually meets at Miller Prosthetics & Orthotics’ new location in Belpre, Ohio: 2354 Richmiller Lane, Belpre, Ohio 45714. Occasionally the meeting is held offsite so to be sure, please check the website each month for the location www.PUGMOV.com or call Nancy at 740-421-4211. There is usually coffee, water and popcorn and lately members have brought a variety of sweets and snacks to share. The group meets the 2nd Tuesday of every month at 6:30 pm. Check PUGMOV.com for location. Whether you are a new amputee or have been living with limb loss for many years, you are encouraged to attend. If you don’t need the support of the group, others may need support from you. Once the presentation loads – scroll down to read. It’s one big page. 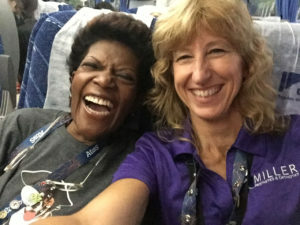 Athletes from all over the world faced off in Rio de Janeiro, Brazil for the 2016 Paralympic Games, and volunteers from the Mid-Ohio Valley were there to help! 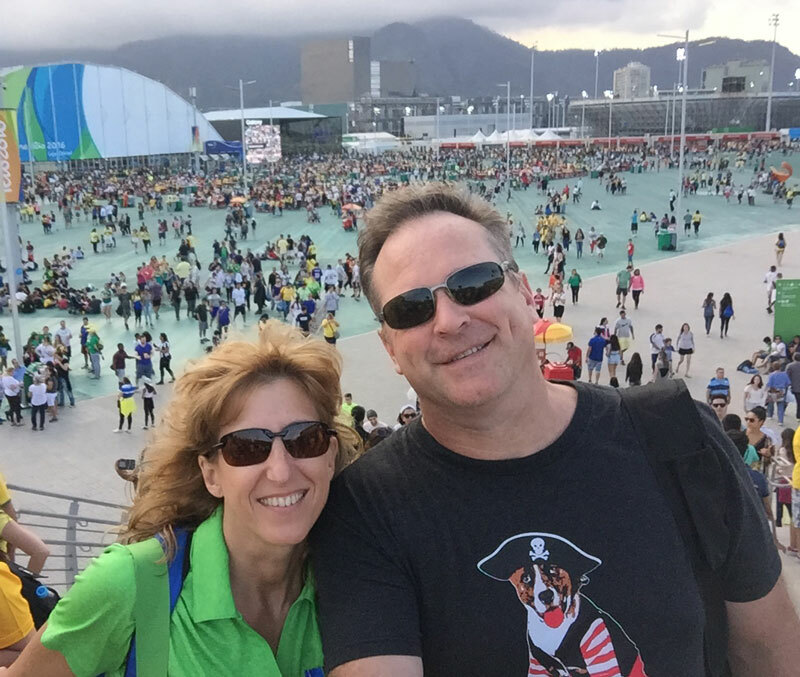 A goal set in 2012 came to fruition four years later when Mark and Nancy Miller of Miller Prosthetics & Orthotics volunteered in the 2016 Paralympics. 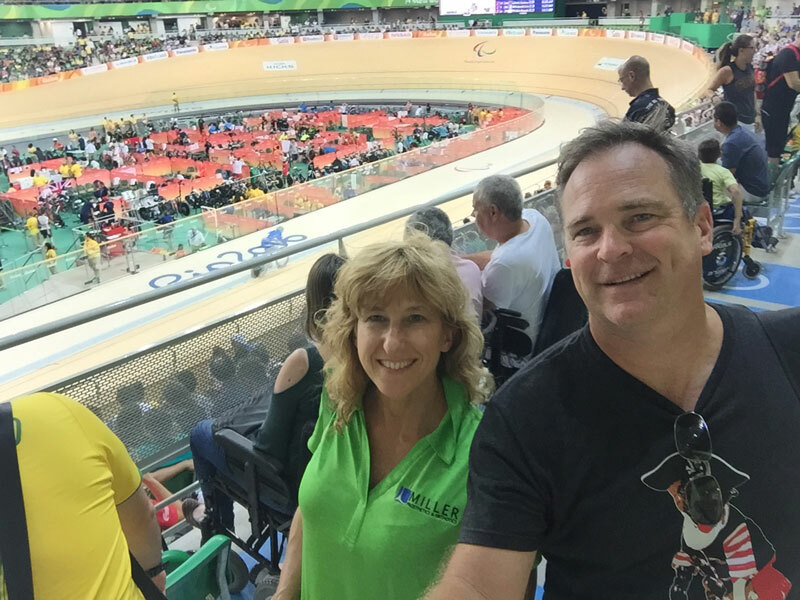 As a Certified Licensed Prosthetist, Mark Miller offered his services in the 1996 Paralympics in Atlanta. This time, against all the risks and warnings, they both made the trip to Rio. The volunteer process involved an online application, skype interviews and online training courses. 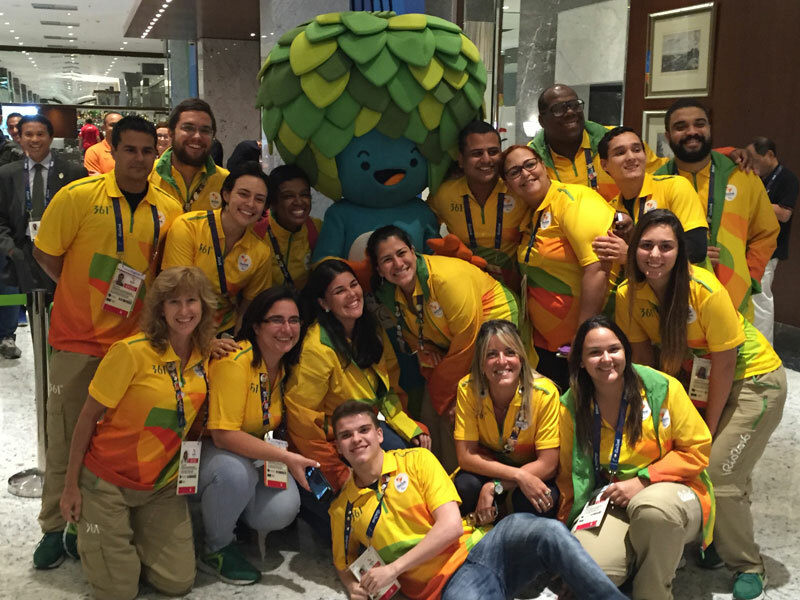 Once selected as a volunteer, the company “Rio 2016” then assigns each volunteer a role and venue, and assigns a work schedule that can be accepted or rejected by the applicant. Volunteers must be willing to serve for ten days. 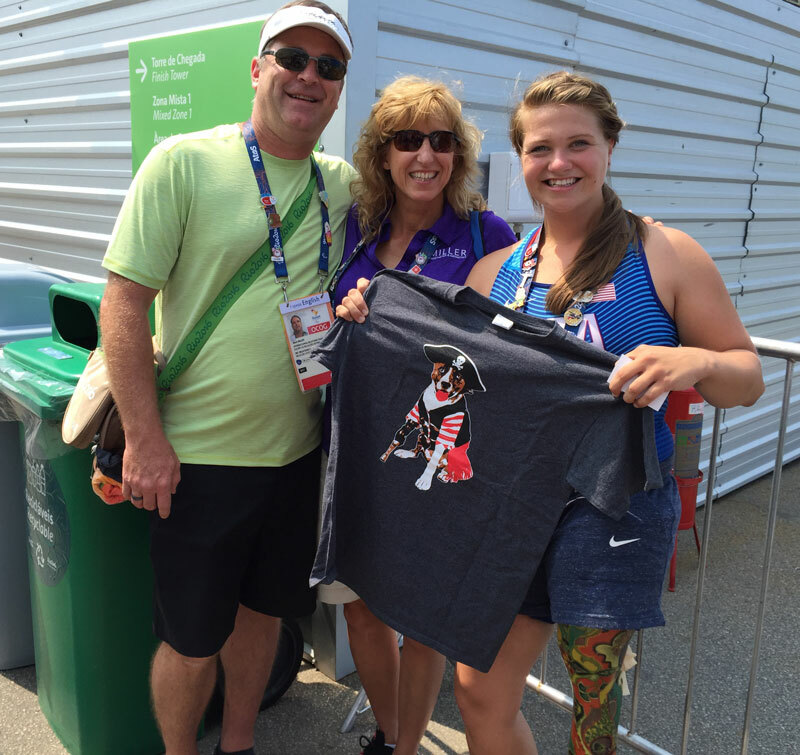 Mark and Nancy give USA Paralympic Kayaker Kelly Allen a Keating Pirate Shirt after her race! Nancy headed to Rio solo since she accepted her month long schedule, which included time before and after the games. 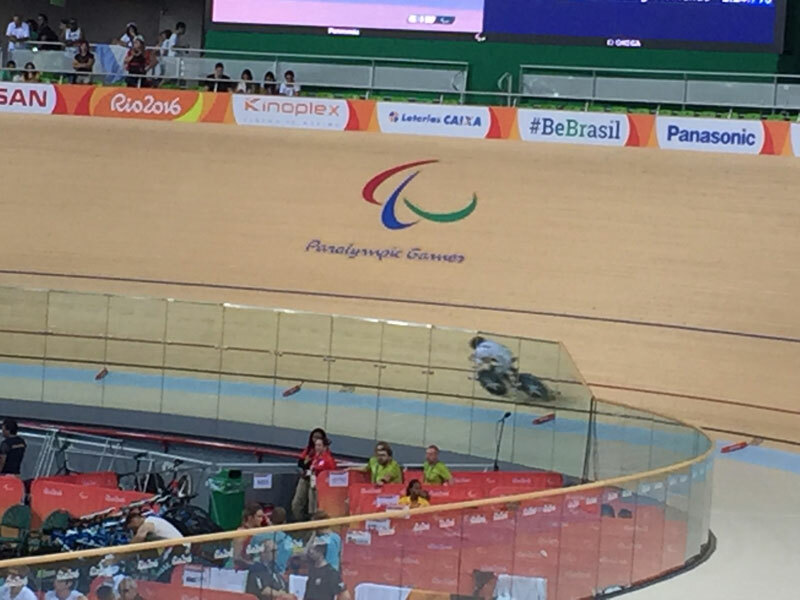 The Paralympic Games ran from September 7- 18 and followed the regular Olympic games. The Opening and Closing Ceremonies were held at the same Maracanã Stadium as the Olympics, and the event venues and Paralympic Village were all held at the same places the Olympics occurred. Olympic Park, Athletes Village and other stadiums were built for the Olympic Games. New highways, subway lines and a new BRT bus system was also developed for the games but will also benefit the people of Rio. The International Paralympic Committee (IPC) is responsible for the Paralympic Games. They work together with the National Paralympic Committees (NPC) from each country. The International Federation of Sport (IF) has a leader in charge of each sport. 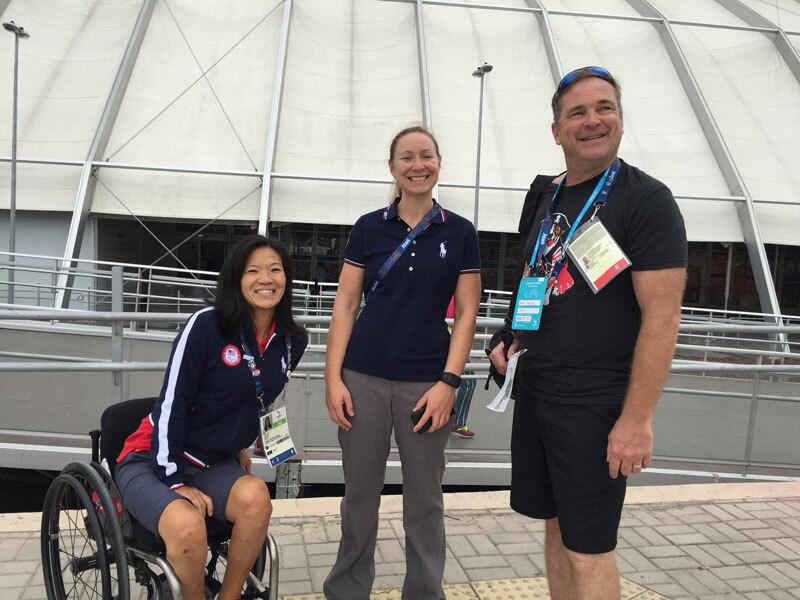 Together the leaders of these groups make up the “Paralympic Family.” Nancy and Mark both worked in the International Relations department and the Paralympic Family Members were their clients. 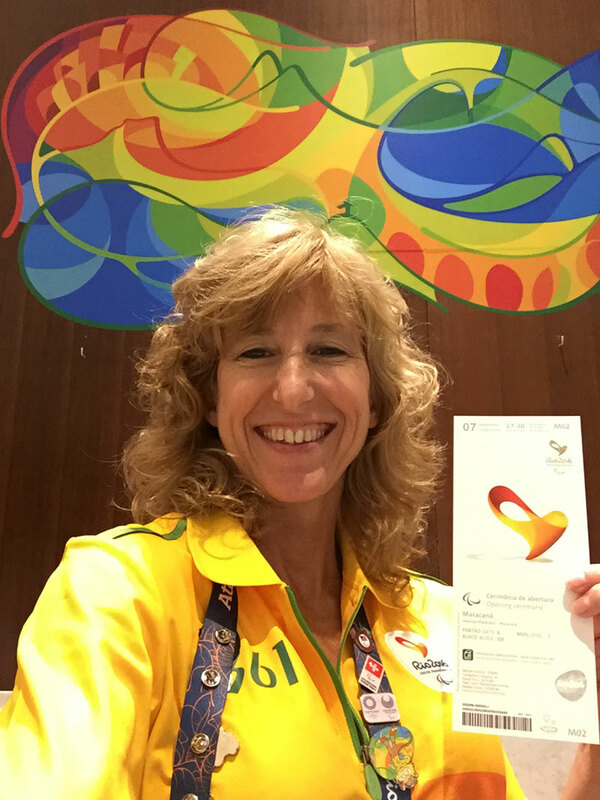 Nancy worked at the Paralympic Help Desk in the lobby of the Windsor Barra Hotel, in Barra da Tijuca neighborhood of Rio. 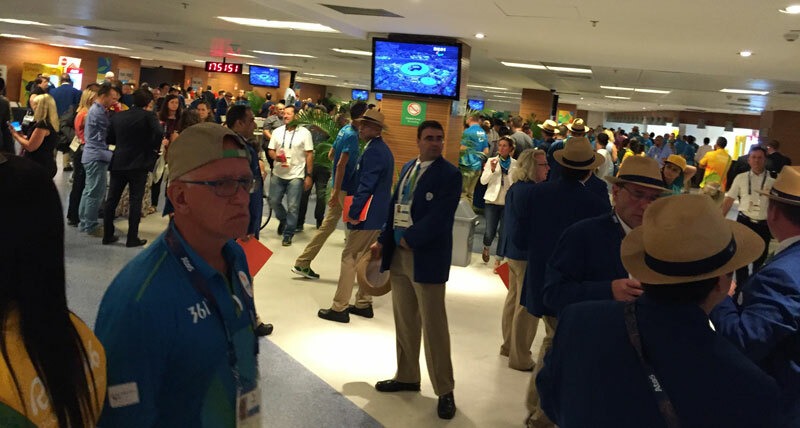 Mark worked at the Tennis Venue at Olympic Park, which was also in Barra da Tijuca, but required an hour travel time between the BRT bus system and the long walk into the park. 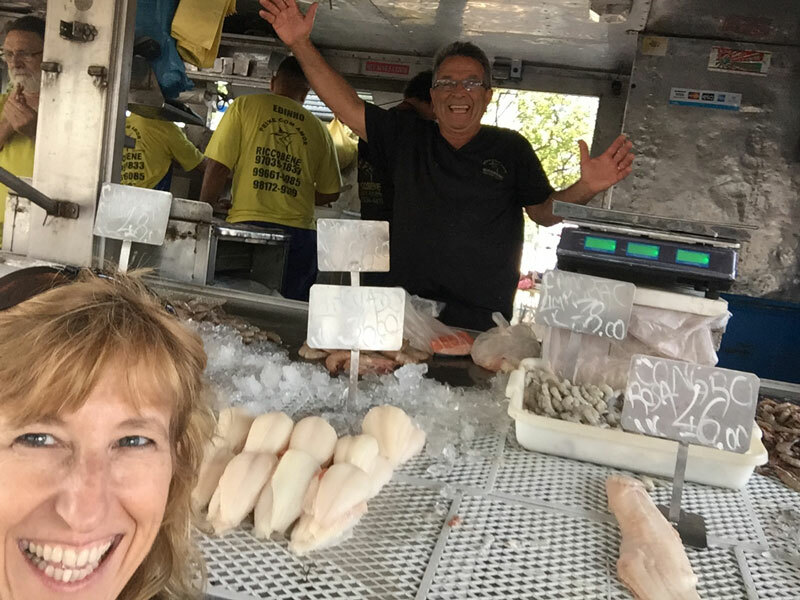 Nancy received her assignment first, so she found an apartment next door to her work location, which happened to be across the street from the Barra da Tijuca beach. The location was fabulous. The ocean and the beaches are scattered with breathtakingly beautiful granite mountains. Surprisingly the beaches were very clean and the area was probably the safest in Rio. Rio is a very active and health-conscience community. In the morning, people exercise all over the beach, along with jogging on the beach or boardwalk, you’ll find biking, surfing, personal trainers, beach volleyball games and lessons, and even foot volley – which is a combination of soccer and volleyball. There are even exercise stations near each “Posto” which are numbered lifeguard stands. 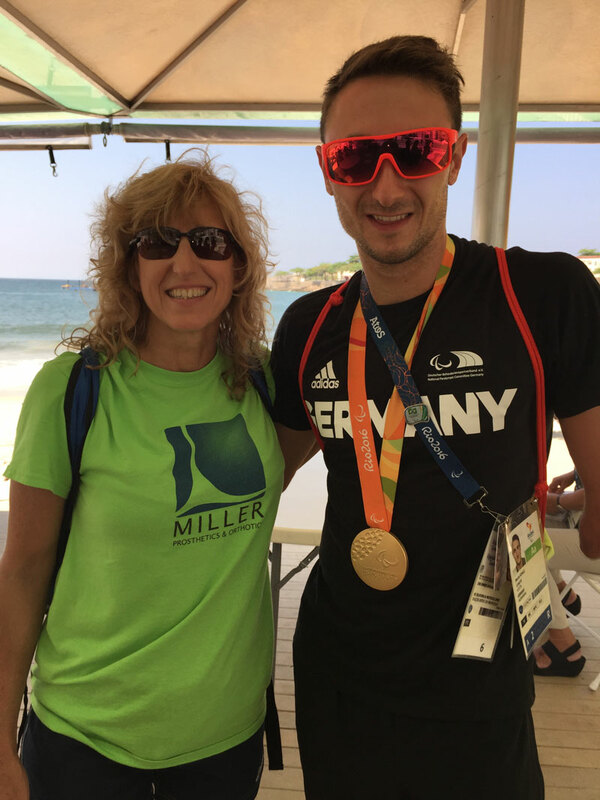 The Millers were able to fit in beach volleyball lessons three days a week before work. It was a double lesson since all instructions were in Portuguese! Along with the lessons, they made great friends with the owner, Cynthia, instructor Alex and many of the students. They even had a going away treat from one of the students with Canjica – a variety of Brazilian white corn served warm with milk, sugar and cinnamon and crushed peanuts on the side. Mark was able to watch wheelchair tennis during some of his volunteer time, and got to know David Wagner, from team USA. Nancy worked behind the scenes with the organizers. Although she didn’t get to work at a venue, she was given tickets to several events including the Opening and Closing Ceremony. 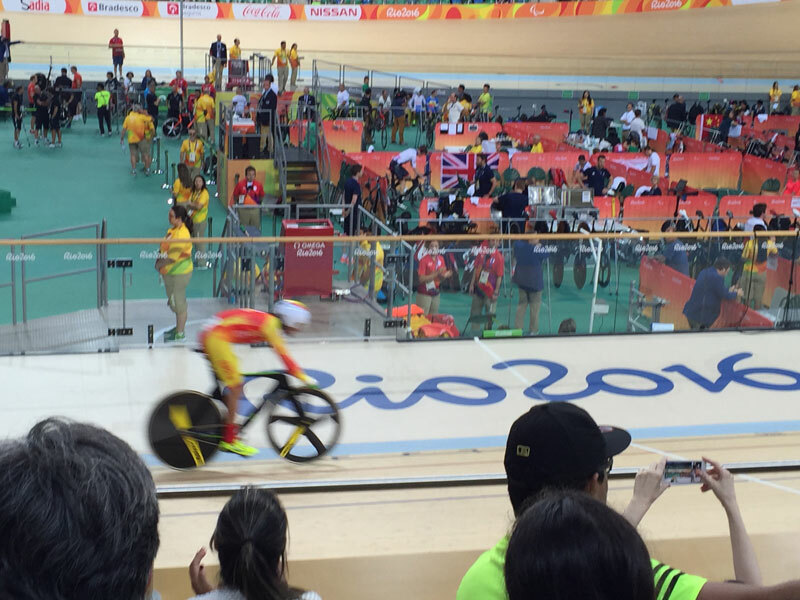 The seats were actually some of the best in house, and included access to the Paralympic Family Lounge. The lounge ended up being a great place to get to know some of the leaders from each country, and learn a bit about how the organization of the games works. The Millers’ were able to sync their schedules and attend several events on their time off. They watched Wheelchair Rugby, Women’s Triathlon, Cycling, Wheelchair Tennis, and Canoe Sprints (which were actually racing kayaks). There were so many more events they wanted to see, but it was tough to fit everything in. The venues were very spread out. The track and field events, for example, were across town, almost two hours away. The athletes were absolutely amazing. Nancy said “the wheelchair rugby had serious bumper action, even overturned chairs and the wheelchair tennis players would easily beat me”. 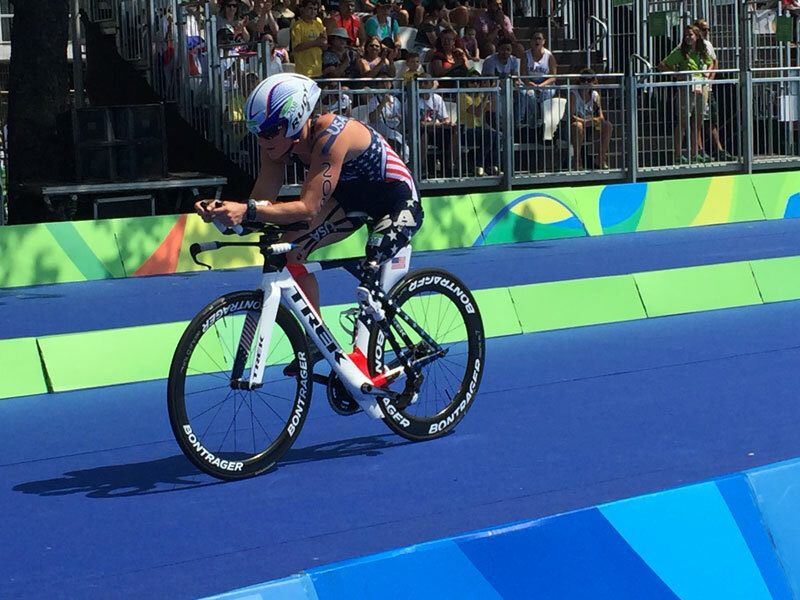 The United States women swept the triathlon, with Allysa Seely taking Gold, Hailey Danisewicz taking Silver and Melissa Stockwell with Bronze in the PT4 category, and Grace Norman crossing the finish line first, taking the gold in the PT2 category. The athletes are categorized according to their level of ability. The wins were extra rewarding in this inaugural year – 2016 was the first year the triathlon was an official sport in the Paralympics. 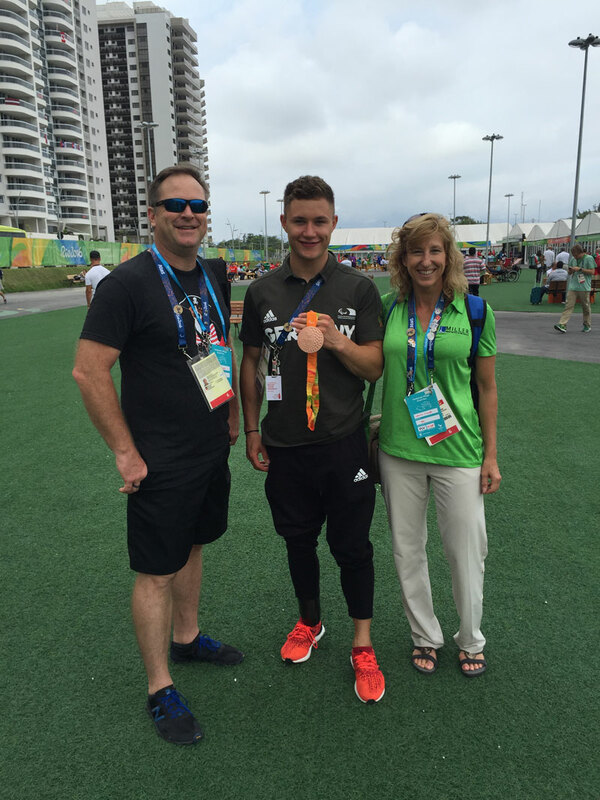 The Millers also witnessed the inaugural canoe event and met the Kelly Allen, the USA female athlete after the race. They congratulated Kelly with a Keating Pirate shirt! 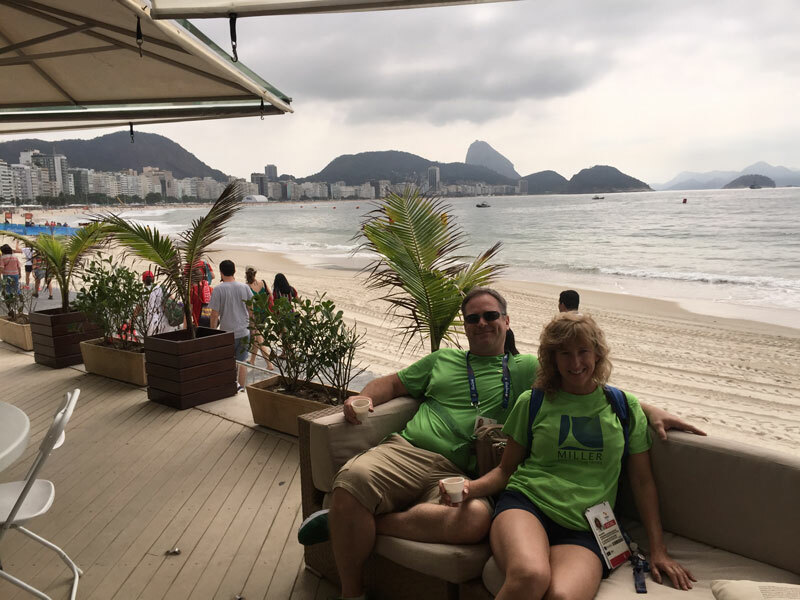 When asked what the best part of the trip was, Nancy replied “By far the best part of Rio and this Paralympic adventure was the welcoming nature of the Cariocas and all of the Brazilian people. (Cariocas are the proud people who are originally from Rio.) In all of the places we have been, we have never met more friends and felt more welcomed than we did in Brazil.” In fact, Nancy met Claudia originally through Air B-n-B and in person on Nancy’s second day in Rio, and now has a best friend for life! 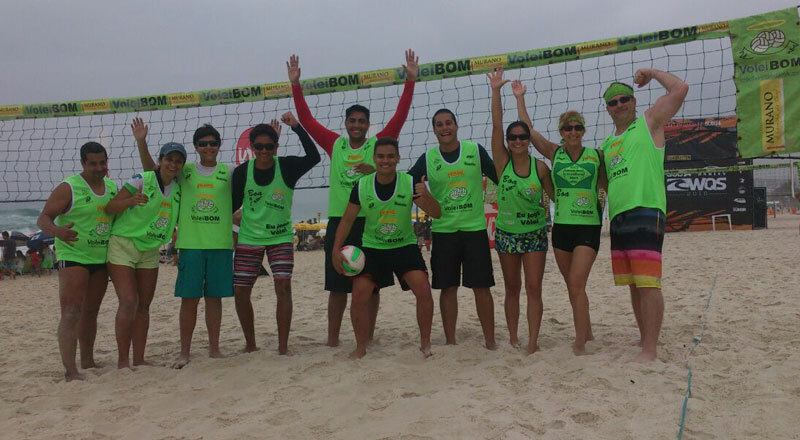 Along with Brazilians, they made new friends from all over the world! They were invited to the German House, and danced the night away on a dance floor filled with a good mix of Germans and Brazilians along with athletes, people dancing on their feet or in their chairs. Trading pins is a key activity among people involved with the games. The Millers were prepared with pins of their own to trade. 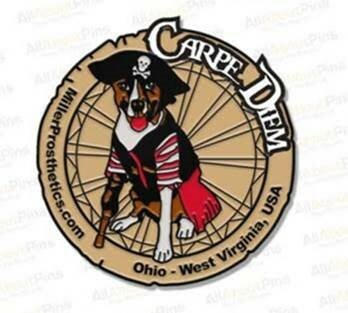 The “Keating” pins featured their amputee pirate dog with Carpe Diem, Ohio – WV, USA and their website. The pins along with similarly made Keating shirts were a big hit with everyone. They returned home with a new collection of pins from around the world and two athletic shirts from Ireland and Portugal. One sunny day off after the canoe sprint event, Mark and Nancy fit in some sightseeing. They took a train to the top of Corcovado mountain to see “Christ the Redeemer” up close. Christ the Redeemer (Cristo Redentor) is a statue that is two-thirds the height of the Statue of Liberty. There, on top of one of the new seven wonders of the world, they ran into Mark’s new friend, David Wagner, who just took the silver medal in wheelchair tennis. From there the Millers headed to Sugarloaf Mountain, where they took a cable car to both mountain tops. On the highest peak, they ran into more friends – this time, it was the NPC President from Ireland and his wife Jimmy and Catherine Gradwell. The Millers then found their way to an amazing bar/restaurant with an indescribable view and met the Mullen family from Scotland. Turns out their son Andrew Mullen swam for Great Brittan’s Paralympic team. The Millers were able to catch Andrew take the Silver in the 50m backstroke the next evening on Sportv and recorded the medal ceremony for them. The last week Nancy was in town, she shopped for gifts for members of the Prosthetic Users Group. This group of friends with limb loss meets the fourth Thursday of the month at Shoney’s in Parkersburg, WV at 6:30. Please spread the word to anyone you know with limb loss. You can read more about their Paralympic Adventures and see photos at Millerpo.com – click on the “Rio” link on the top right. Nancy Miller takes the advice of a friend, and jumps off a cliff! Fortunately it was with Renaldo Pereira da Silva, “Jajao”, a hang gliding and airplane pilot with over 25 years flying experience. The kites glide on the ocean winds over the Pedra Bonita mountains in Sao Conrado neighborhood of Rio de Janeiro. 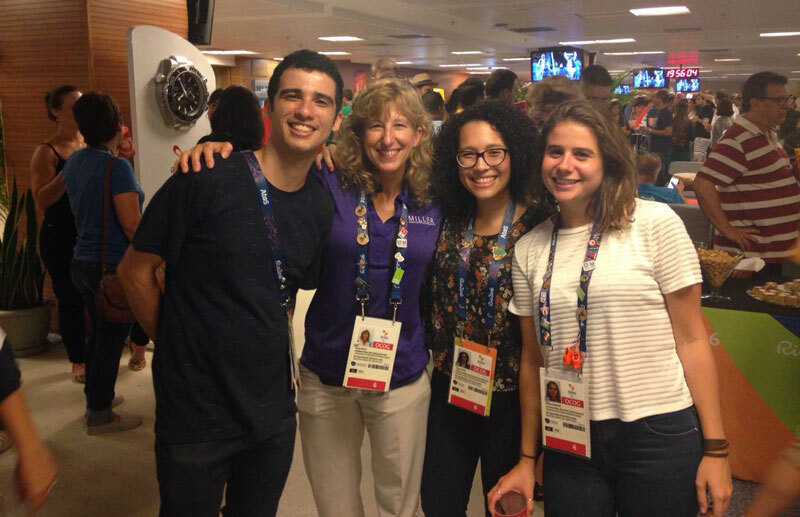 Nancy was in Rio for one month to volunteer for the 2016 Paralympics. She was delighted to end the trip with a beautiful day for flying, and an amazing adventure. Mark would have joined Nancy on this adventure, but during the games, there was no flying due to National Security issues. They plan to go back so that Mark can experience this amazing adventure! 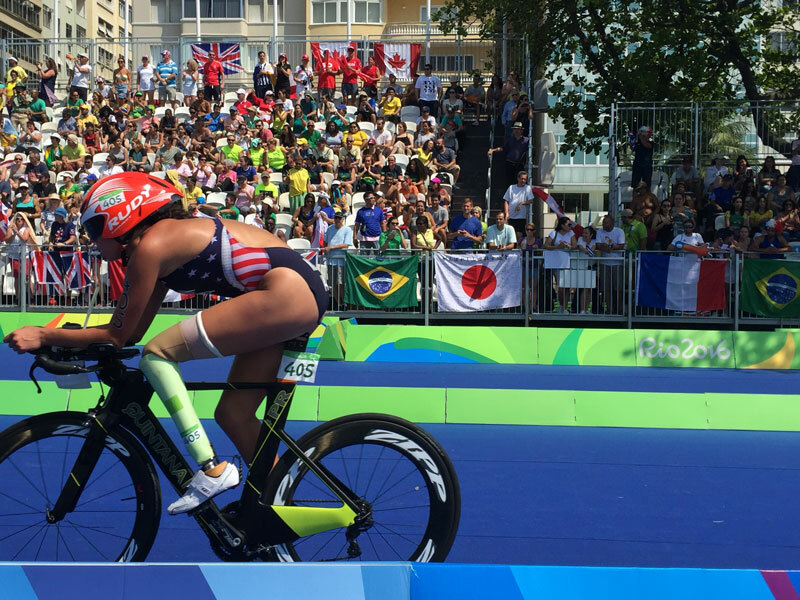 USA Sweeps Women’s Triathlon and We Were There! 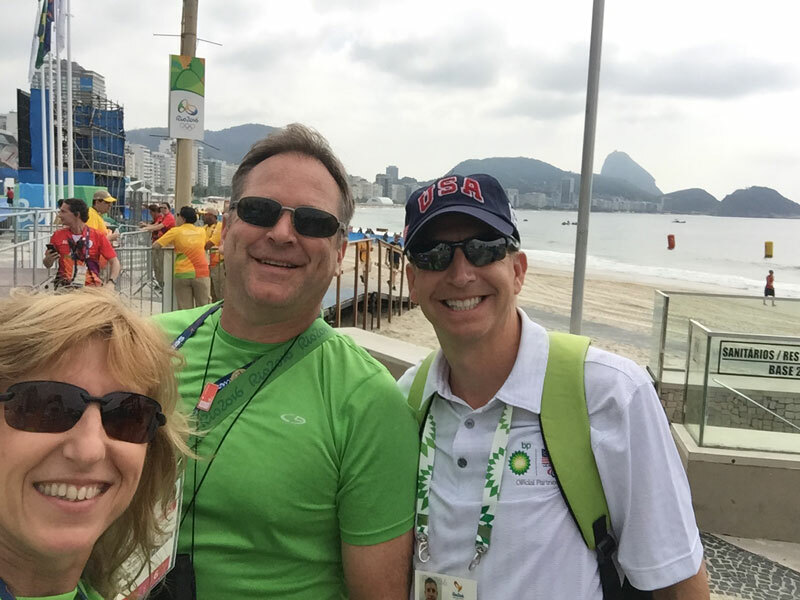 Mark and I woke up early and headed to Copacabana Beach for the Triathlon. We took the new segment of the metro (subway) line that was only open to people with tickets or credentials. We had credentials, but no tickets. We didn’t think we needed tickets and thought we could just watch from the beach. We had a short walk from the subway to the event at Fort Copacabana, and the race started at 10 am. When we arrived at the beach, we found that the roads were blocked off and there was a big fence for the event. As we approached the entrance, one of the volunteers noticed the “6” on our credentials and ushered us to the entrance area. From there we were passed off to other volunteers as we crossed the event course and led right into the Paralympic Family Lounge. We couldn’t believe it! Evidently the department we work for has the best credentials out of all volunteers and gives us access to the lounge, including the best seats, food and beverages. These seats included couches and nice chairs set up on a platform on the beach, with access to the swimming transition area. Nancy and Mark Miller with George Bauernfeind, from BP in the lounge viewing area. Congratulations to Martin Schulz, who won the Gold Medal in the Triathlon for Germany on the previous day, September 10. Each medal also makes a different sound for the blind athelets. We were there for the start of the race. It began as swimmers dove from a platform set up in the ocean and swam 750m (.47 miles) to the beach. 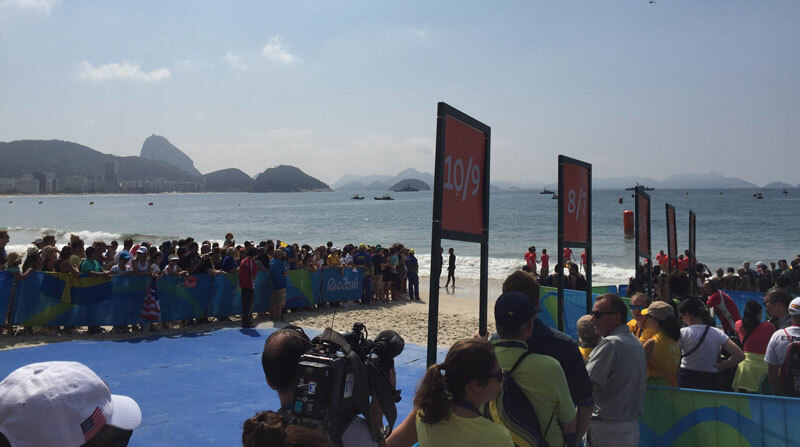 We made our way to the beach transition area where the athlete’s families were watching. We were privileged to be standing right next to the family of USA athlete Melissa Stockwell, who was a first lieutenant in the Army and the first female soldier to lose a limb in the Iraq War. We also met the volunteer team physician, Andy Gerken. Andy was so helpful as he informed us about each USA athlete as they came out of the ocean to get transition to the biking segment. The athletes were simply amazing – especially to swim in the ocean with such current and exit the beach still full of energy to don their prosthetic leg. Triathlon transition area from swimming to biking. The transition from swimming to biking was amazing. The athletes with limb loss swim without a prosthesis. They exit the water with help, go to a chair on the beach and put their leg on so fast you wouldn’t believe it! Then they run to the biking area where they bike 20km (12.4 miles) which is several laps around a roped off course before they transition again to the 5K (3.1 mile) run. We were going to leave before the race ended since we both had to work that afternoon. BUT – the USA women were leading the race so we had to stay. 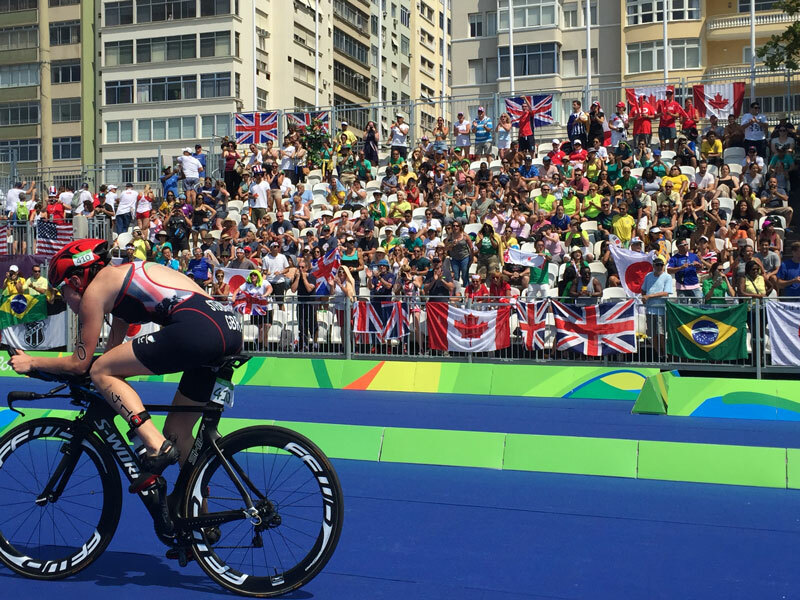 Then Triathlon made it’s debut to the Paralympics with this race in Rio and the USA women dominated! Triathlon was accepted onto the Paralympic program for the 2016 Games in Rio and it consists of a 750m swim, a 20km cycle and a 5km race to the finish line. The sport is divided into five classes for both men and women. PT1: This class is for wheelchair users. They swim, cycle using a hand-bike and complete the 5km run in a racing wheelchair. PT2-4: These classes are for ambulant athletes whose impairments include loss of muscle strength, range of movement and loss of limbs. They can cycle using approved adaptations and run with or without the use of prosthetics. PT5: This class is for visually impaired athletes who have the option to ride a tandem cycle and run with a guide. After the race, Mark and I found our way back to the subway and headed home. 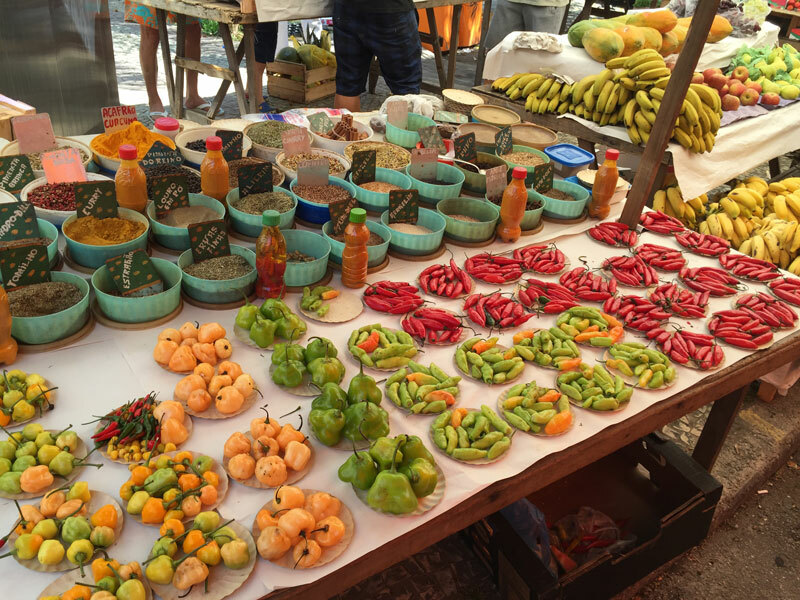 On my way back, I was a bit side tracked by the Sunday market near my apartment, so I stocked up for the week. Mark made his way to Olympic Park where he started his volunteer job a the Tennis Event. We toured Paralympic Village and Ottobock on Saturday, Sept 10! The only way in to Paralympic Village is with special credentials, which we did not have. But…on my way to Rio trying to tie up loose ends at the airport before leaving the country, I spoke with Crystal Schultz from Ottobock about our account. I mentioned that I was on my way to Rio, and she informed me that Ottobock (who is one of our prosthetic manufacturers) is a major sponsor the Paralympics. They set up a repair clinic with a full lab in the Village, and have several satellites clinics at each venue. This year they brought in 100 technicians from 31 countries to cover 26 languages in order to repair or replace prosthetic limbs and wheelchairs all at their own expense. You can read more about Ottobock’s deep involvement with the Paralympics on the Ottobock website. Crystal was so proactive and quickly connected us with Adam McPherson at Ottobock who did a lot of leg work to arrange a tour of their repair center in the village. (Thanks again to Crystal and Adam for all the work you did for us!) Adam put us in touch with Matt Swiggum, Executive Vice President of Sales & Marketing at Ottobock, who was in Rio and was scheduled to meet us on Saturday at 1. Although Matt couldn’t make it, he made sure his team took care of us, which they did. At the Village, security was tight as expected. We had to submit our passport information in advance, which was matched with our passport that was held at the Village while we were inside. We were greeted by Beate Hilpert, from Ottobock’s German headquarters. 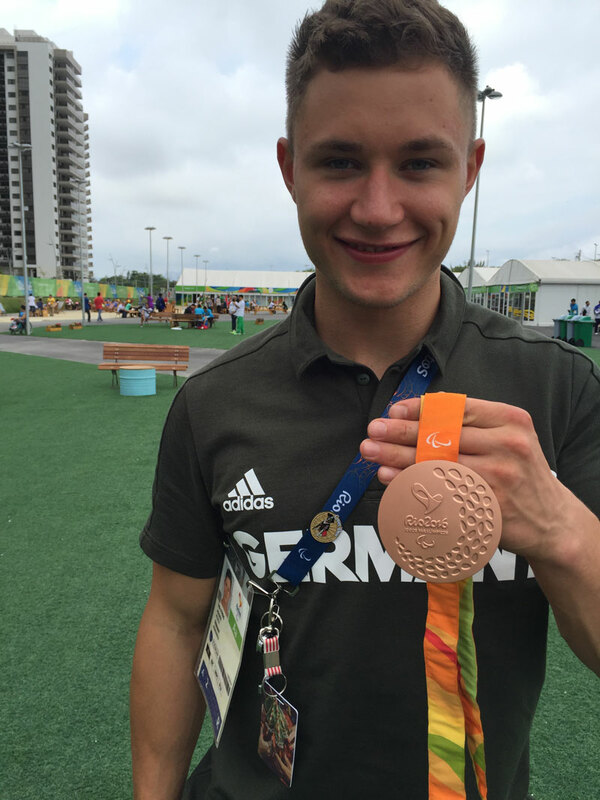 We immediately encountered an athlete from Germany, Felix Streng, who had just won the bronze medal for the 100 meter dash! Mark, Felix and Nancy. Each medal also makes a different noise for the visually impaired. Beate then took us through the village to the Ottobock repair clinic, which was set up in a section of the dining tent. 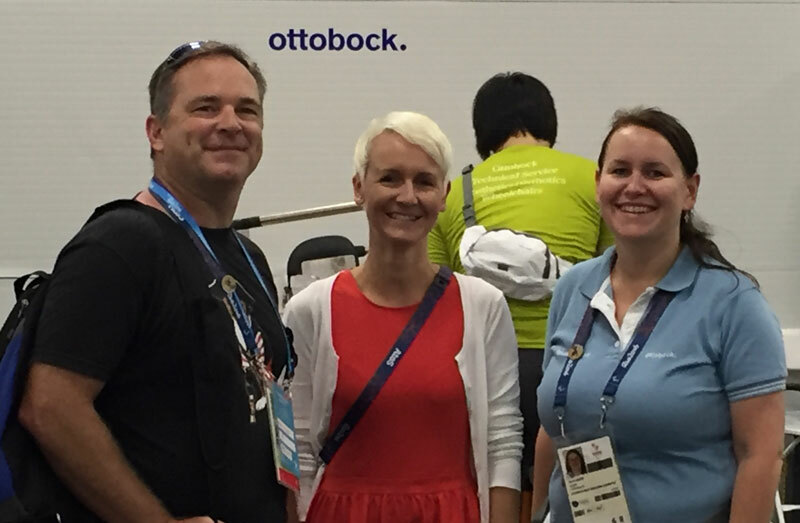 There we met Christin Gunkel, Chief Marketing Officer for Ottobock in Germany as well. Christin described the wheelchair repair process and area, the private fitting rooms, and the technicians lab. Ottobock technicians are not permitted to improve the athletes current equipment, they can just repair or replace of components of equal value. 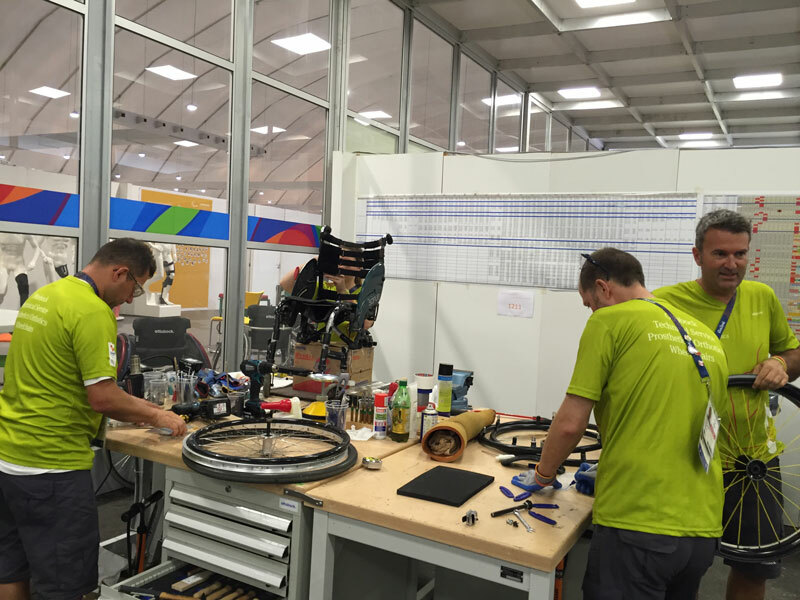 Ottobock has a complete lab, with all of the tools and inventory necessary to enable the athelete to compete if their equipment fails for some reason. 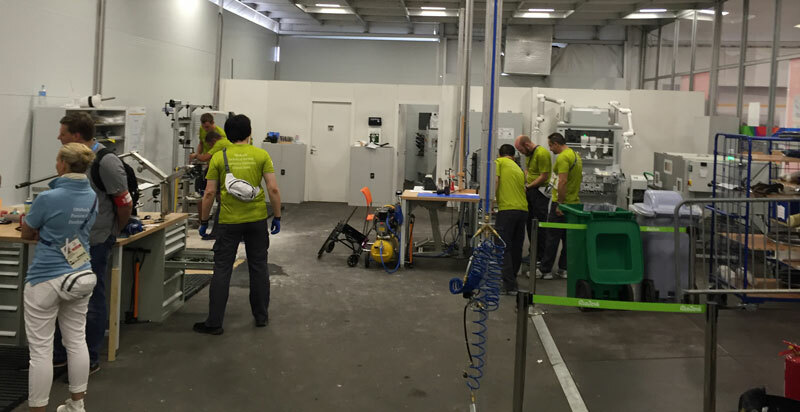 Ottobock even stocks components from competitors in order to complete server the athletes. The investment Ottobock puts into the Olympics is incredible. We thank them for all they do for the athletes. The Ottobock Workshop in the Village. Wheelchair repair in action. Ottobock also provides loaner wheelchairs, which are often much better than the originals and are used throughout the games. After the tour, Mark and I explored the village a bit. It was lunchtime, so everyone was walking our way. We ran into some of the USA staff. Here you see people from all countries with an range of activity limitations from limb loss to blindness. The village was built to be accessible for all athletes, although some of the bridges would be a challenge for me if I was in a wheelchair. The village was built for the Olympics and Paralympics. It consists of high rise apartments to hold around 18,000 atheletes, officials and trainers. There are also a series of large tents set up for Dining, Medical, Gym and offices. Flags from each country lined the main road, and the apartments were separated by a grassy park with logos and statues for great pictures. 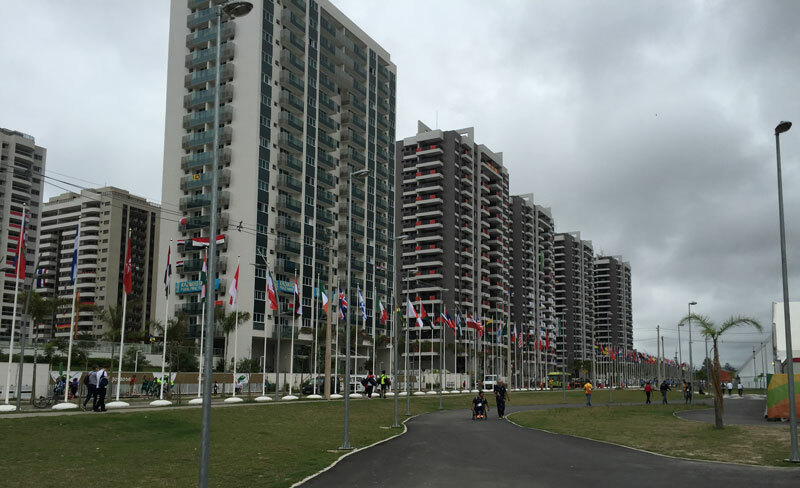 A few of the row of flags and apartments for the athletes in the village. 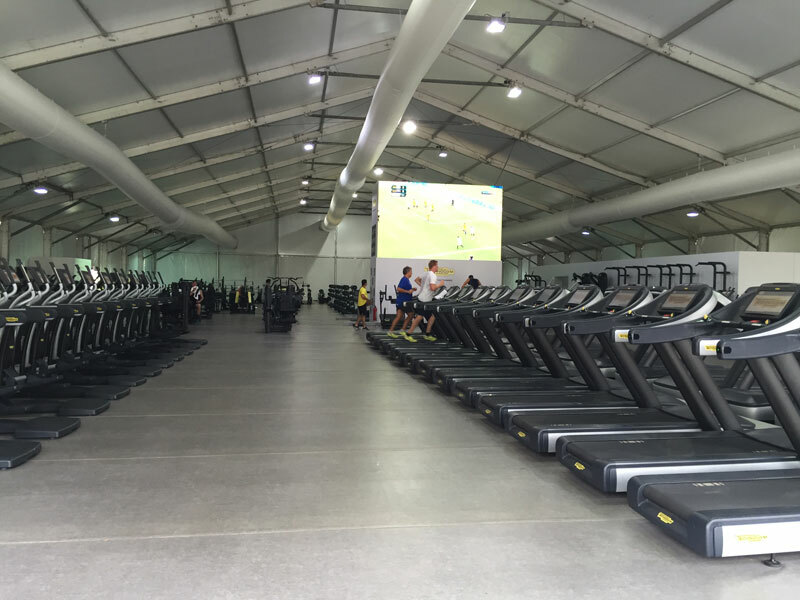 The athlete’s gym in Paralympic Village. Mark and Nancy at the entrance into Olympic and Paralympic Village. This is the Official Paralympic Logo – it is equivalent to the Olympic Rings. We are in the park area of the Olympic and Paralympic Village. Nancy and Mark in the park area of Olympic and Paralympic Village. Thanks again to Crystal, Adam, Beate and Christin for the tour of Ottobock and the Paralympic Village. Mark and I really appreciate the unique opportunity. The village is something that even my colleagues who worked during the Olympics were not able to visit. Thank you and congratulations to the athletes for their incredible drive, fitness and for the motivation they provide to everyone worldwide. Mark joins Nancy in Rio on Friday, September 9th! 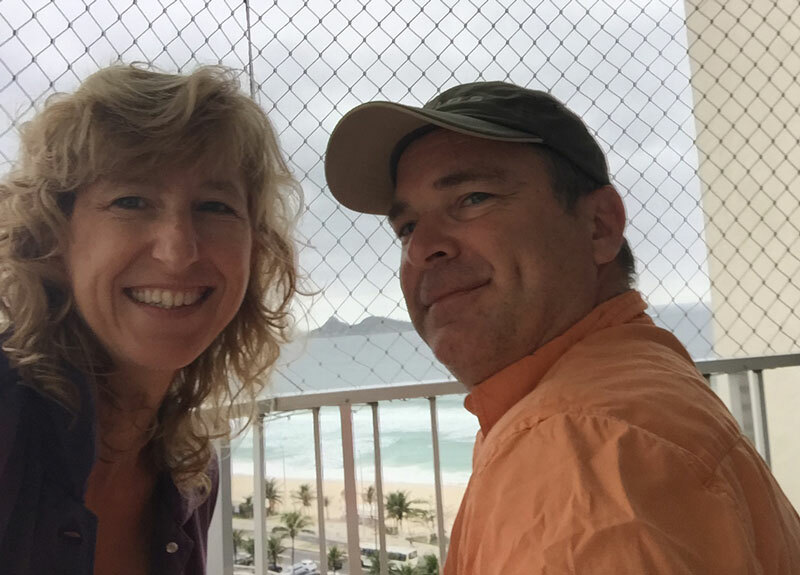 After being in Rio for two weeks solo, Mark joined me on Friday, September 9! Nancy and Mark finally together for breakfast on our patio! 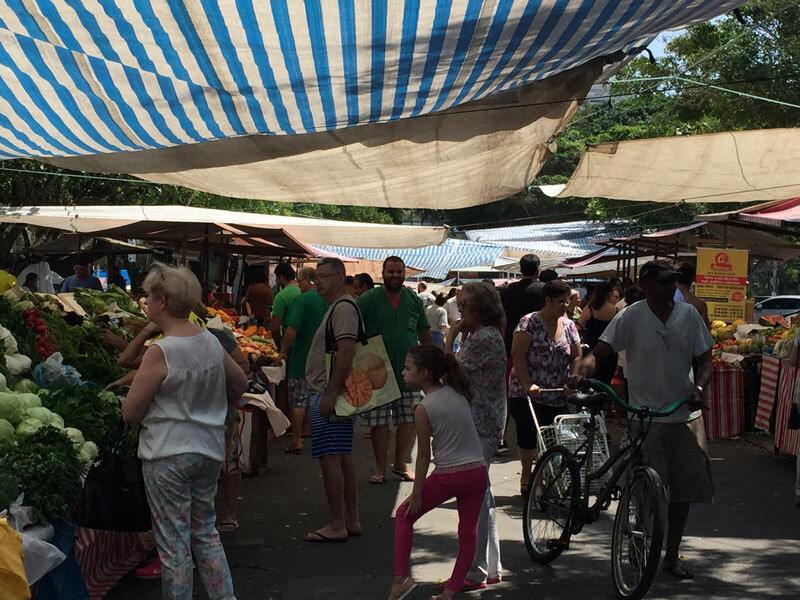 Traveling to Barra da Tijuca is not the easiest feat. Mark left on Thursday evening and arrived in Brazil Friday morning at 8 am. It takes two buses and about two hours with traffic to get to the Western region of Rio called Barra da Tijuca. (Pronounced Baha) Plus riding the bus is tough. It’s rare to find someone who speaks English, and it’s very difficult to know when to get off the bus and how to transfer. He finally made it, exhausted and burdened with luggage, but he was finally here! Yay!! He was able to rest for a few hours before he had to turn around and go north of the city to get his credentials and uniform. It was another painful travel trip. This time he used Uber, but found himself stuck in too much traffic. Lesson learned – on a long trip, don’t select the “share a ride” option with Uber. He had to go out of his way for two extra people and only saved a few dollars. The volunteer coordinator in my department (International Relations Protocol) was able to assign him to our team, but station him at the Tennis Venue. As a reminder, our team takes care of the Presidents, Secretary Generals and guests of the International Paralympic Committees (IPC), The National Paralympic Committees (NPC) for every country and the International Federation (IF) for each sport. The leaders and their guests from these three groups are called the “Paralympic Family”. I was able to set his schedule to match mine and have mornings free for the beach volleyball class! Although his first day was filled with too much travel in tons of traffic, at least he got it out of the way and consolidated the errands in one day. He was scheduled to work Sunday-Thursday. 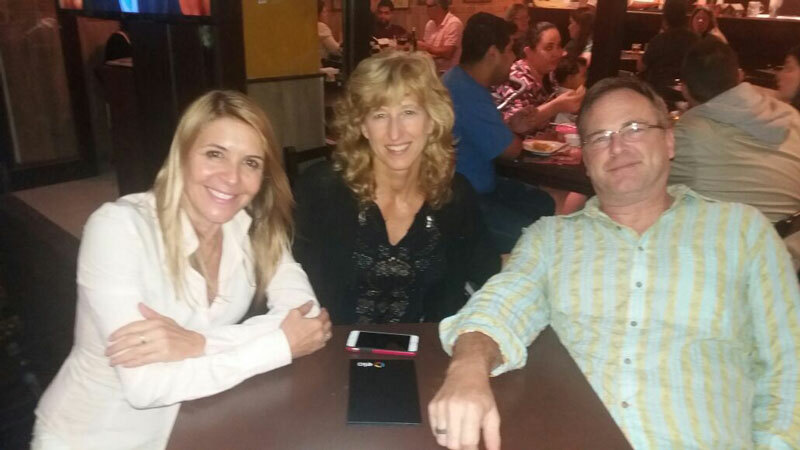 After a day of traveling, I was able to introduce Mark to my new best friend in Rio, Claudia. She met us at a nearby restaurant. Claudia joins us for dinner at a nearby restaurant. We didn’t stay out late – Mark was exhausted and he needed to rest for our volleyball class the next day. Mark’s first Portuguese/Volleyball class. Everyone loved him of course! Chilled coconut water is served straight from the Coconut. You can buy them everywhere for about $2. The tennis venue is at Olympic Park, and it also takes a while to get there. From our apartment, it’s a 20 minute walk to the BRT station (or a 10 minute bus-ride). The BRT is a new bus-line made especially for the Olympic and Paralympic games. The buses have their own lane on the highway, blocked off by a curb. There is an express bus that goes from our stop directly to Olympic Park. So although Mark gets the excitement of working at an event, it takes about an hour to get there and he is often stationed outside – today it was really hot! He also has to stay until the competition is over, and they have been running late. My assignment on the other hand is next door (3 minute walk) inside a comfortable air-conditioned hotel lobby, but not near the excitement of the competitions. I am happy with my job, it’s close and comfortable, I meet organizers from all over the world, and I can still fit in the games when I am not working. 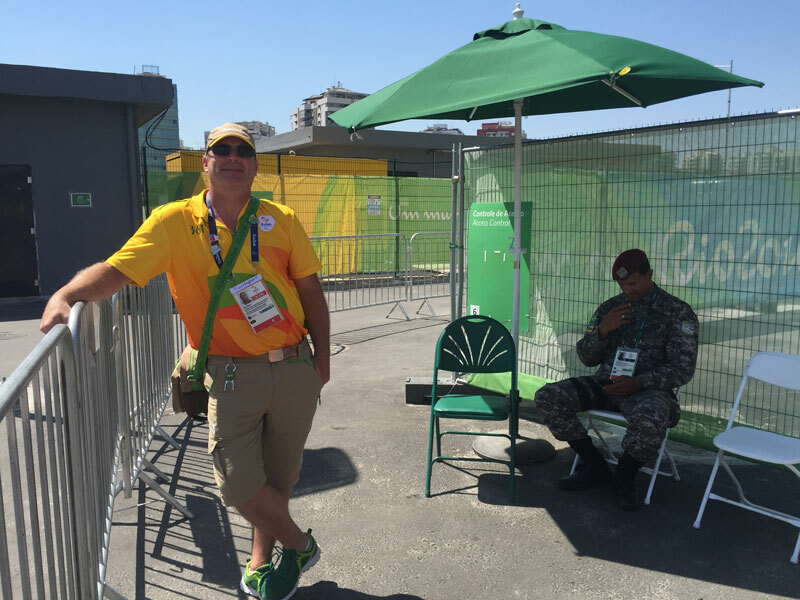 Here is Mark in his uniform at one of his stations at the Tennis Venue. Mark and I headed to Olympic Park after our visit to Paralympic Village on Saturday, September 10th. We had tickets to the cycling event. Olympic Park is massive. There is an open space in the center of the eight huge stadiums where people can purchase food and eat at picnic tables. 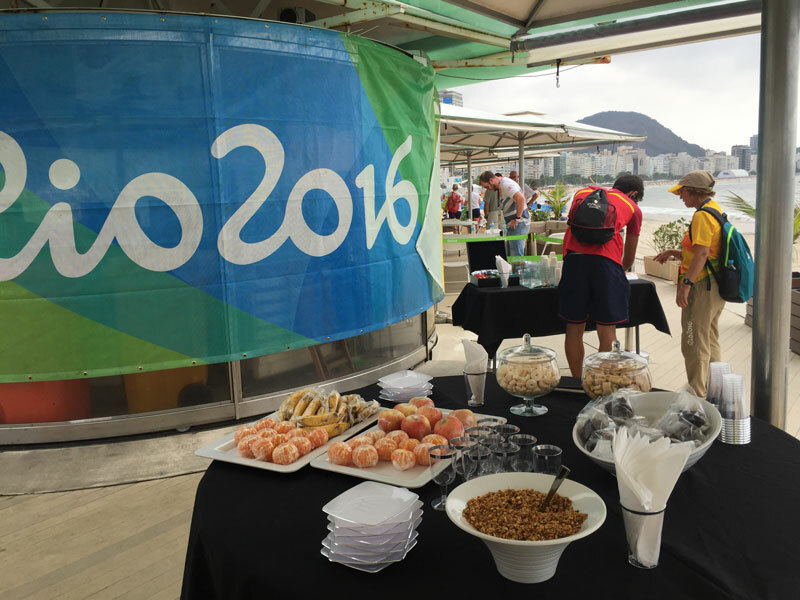 We were starving, so we ate first and then headed up the steps to the Rio Olympic Velodrome for Cycling. Nancy and Mark with Olympic Park picnic/gathering area in the background. 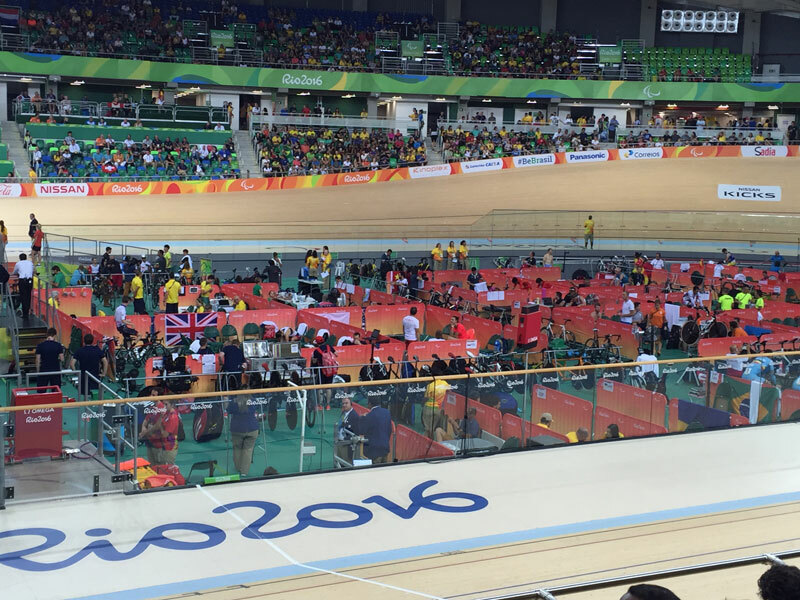 Here is a panoramic shot of inside the Rio Olympic Velodrome. A view of the center staging area at the cycling event. After the event, we made our way to the Japan House. At the Olympic and Paralympic Games, many countries host a “house” that showcase their country. 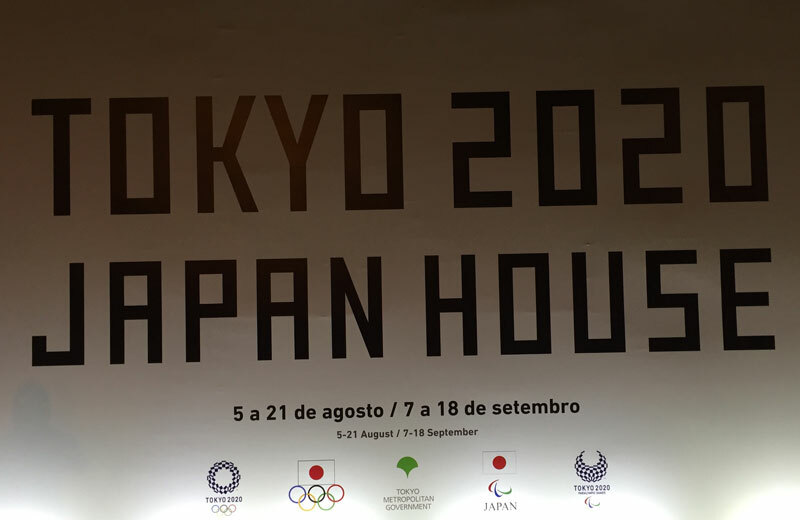 The next summer Olympics will be in Tokyo 2020, and the Japan House was open to people who had a tickets to the game or other credentials. The credentials that Mark and I have for volunteering give us access to a variety of places, including the Japan house. In fact, because of the department we work for, our credentials get us into every venue, and even the lounge areas with complimentary food and beverages. We finally made our way from Olympic Park through highway traffic (that looked more like a parking lot) to the Japan House. We checked out the exhibits and made our way to the sushi stand. We were exhausted after a big day, and headed home after that. Paralympics Opening Ceremony Rio 2016! 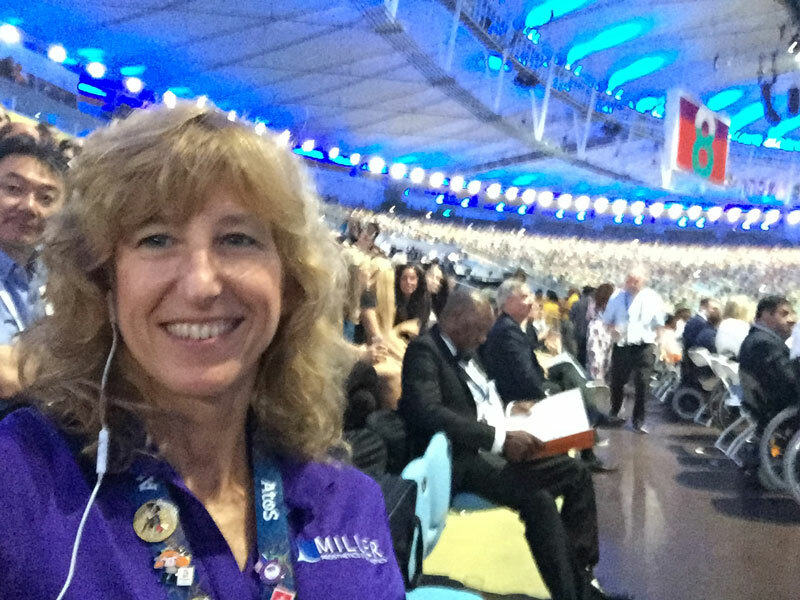 The Opening Ceremony for the 2016 Paralympics in Rio, Brazil kicked off at 6:15 on September 7, 2016 and I WAS THERE!!! As soon as I established my volunteer schedule and found that I could take time off for the opening ceremony, I tried to purchase tickets. Unfortunately, the first two tiers were already sold out, and the prices were getting a bit expensive. A few volunteers said to hold off on the purchase because they all received tickets for the Olympic Opening Ceremony and there was a good chance that we would get them for the Paralympics as well. The risk was that you had to wait until a few hours before the event, but it was worth the risk because they would be very good seats. I took the risk. I waited. At 3:00 that day, my dream of getting a ticket came true! 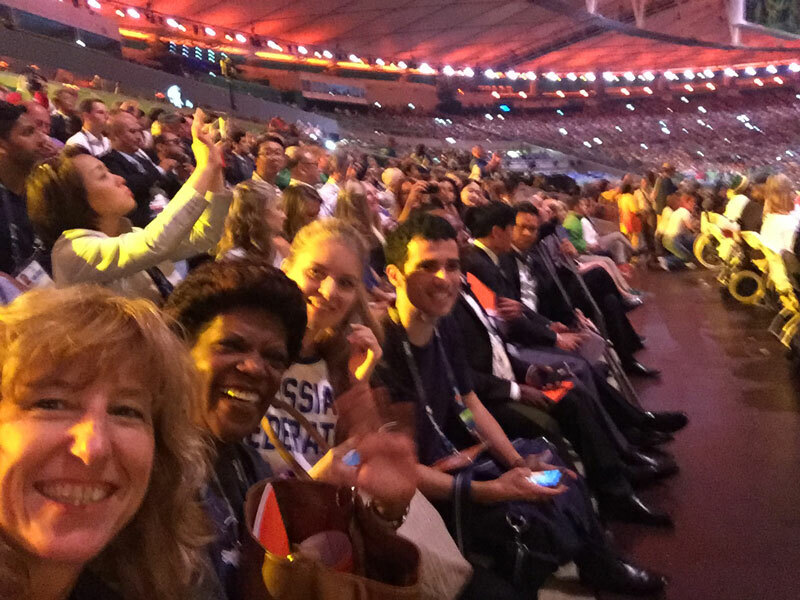 Our team as well as the other volunteers in our area received VIP tickets, which included access to the Paralympic Family Lounge with complimentary food and beverages. Travel to the Maracana for us should have been by the metro (subway). However, we were lucky enough to board a very comfortable bus for the 45 minute ride to the stadium. We could not wear our work uniforms, so I ran home to change and grabbed a Keating pirate shirt for Helena. We jumped on the bus and were on our way to the ceremony to join all of our clients. My VIP ticket for the Opening Ceremony! Helena and Nancy happy to be on the bus! The show kicked off with an incredible stunt when extreme wheelchair athlete Aaron ‘Wheelz’ Fotheringham raced down a six-story high ramp, jumped through a giant hoop and landed on an inflatable mattress. At that same moment, fireworks exploded from the top ring of the Maracana stadium and the party began. There were many great performances and the crowd was alive with energy. As each country paraded through the stadium, they carried a puzzle piece. My heart was filled with pride when TEAM USA entered the Maracana carrying our flag. For their entrance, I made my way down to the front row. When the last puzzle piece was place, the puzzle turned into a beating heart, with the entire place feeling the vibrations from head to toe with only red lights pulsing and filling the air. There was also an amazing video of fathers with their paraplegic children wearing special suits with boots to enable their kids to walk with them, and even play soccer (football). Chills ran through the crowd when children with their fathers from the video carried in the Brazilian flag. More emotion filled the air when the Paralympic Torch entered the stadium. It was passed through several athletes. While carrying the torch, Marcia Malsar, a 1984 gold medalist – who was the first Brazilian ever to win gold at the Paralympic Games stumbled, fell, and dropped the flame. She was helped up by the assistants on the field and picked the torch back up. The crowd exploded to their feet with applause as she overcame the fall. The last person to take the flame to its home for the game waited at the foot of the stairs while they transformed into an accessible ramp for his chair. He made it up the ramps, lit the flame and the games were officially opened. I can’t even explain to you the excitement I felt to be a part of this world event, and to be of the team that is making it happen. Along with the performances, speeches and athletes, we had access to the Paralympic Family Hospitality lounge. Since I have been working with my team and with the clients for over a week, I knew many people in the lounge. It was a great meeting place, and I even exchanged a few pins. A panoramic shot of inside the Maracana. We sat in the section of seat in the middle of this picture. We had access to The Paralympic Family Lounge! Rain was in the forecast, but held off until the end. Fortunately it didn’t put out any of the torch flames! Helena and I headed out with the crowd and made our way back to our comforatable bus for the ride home. The games have officially begun!!! !